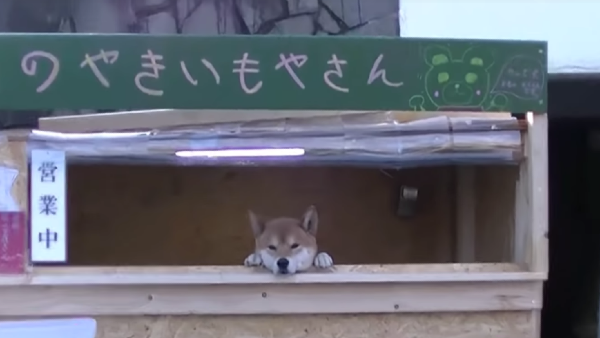 The next time you’re in Hokkaido, Japan, you might want to show your support for small business owner Ken-kun, a three-year-old Shiba Inu who manages a roasted sweet potato stall. The good boy has gained worldwide attention for pursuing ambitions often expected only of humans—he’s here to keep patrons’ tummies and hearts warm. Ken-Kun’s lack of opposable thumbs means he cannot accept card payments, but to fix potential hiccups, his human business partners have installed a money slot for customers. An accompanying sign reads, “Because I am a dog, I can’t give you change,” so visitors are urged to hand over exactly JP¥100 (US$0.91) and help themselves to a serving. Extra cash or tips just means more treats for the hardworking manager. On his days off, Ken-kun is rewarded with nice walks around Sapporo City, so life is pretty chill for the fluffy shopkeeper with big dreams. The pup joins the ranks of three other Shiba Inu dogs, who guard a wall in Kyushu, Japan.